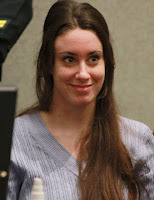 Vicki Voisin - The Paralegal Mentor with Paralegal Career Strategies: Casey Anthony: A Paralegal? News headlines this week proclaimed that Casey Anthony, the Florida resident who was acquitted in the murder of her 2-year-old daughter, Caylee, wants to be a paralegal. "...a person, qualified by education, training or work experience who is employed or retained by a lawyer, law office, corporation, governmental agency or other entity and who performs specifically delegated substantive legal work for which a lawyer is responsible." If my Internet research is accurate, Casey did not graduate from high school, let alone attend college or a paralegal program. Her only "experience" is working on her own murder case. The attorney who represented Casey at her trial, Charles Greene, seems ready to wave a magic wand and bestow the title "paralegal" on her because he thinks she has the “skills” and “desire” to pursue a job in the legal field. Mr. Green also says he believes she has a lot of skills: she's very organized, very intelligent, and very computer savvy. Those are all qualities a paralegal needs -- but they do not automatically make her a paralegal. I have no problem with Casey's ambition to be a paralegal. Everyone should have goals and plans. However, she must first get the necessary education, training and work experience most paralegals have worked so hard to obtain. Serving as the Defendant in a murder trial isn't in any way adequate training for the paralegal profession. What do you think? Please leave a comment below and let me know. I whole heartily agree that she has not earned the right to the title paralegal. It completely undermines all of the hard work and dedication that those of us who have attended school to receive our AA or BA and studied very hard to achieve the CP designation. Although she has been acquitted by a jury of her peers in a court of law, I would have serous questions regarding her ethics. She may well have the intelligence and organizational skills that a paralegal needs and, obviously, she deserves a chance to better herself but I am not sure, were I her prospective employer, that I could ever trust her ethics. For someone who just graduated with a BA in Legal Studies after 9yrs. It galls me to think it is being handed to her because of her notoriety. If she wants to put in the time and effort, by all means. But don't just hand it to her because of her time in the courtroom and in jail. That doesn't qualify her to do the work. I think it's great that she is pursuing work in the legal field, especially if she want to work in criminal law defense. She has gone through her own murder trial and she was found innocent by a jury. It's time for her to go on with her life. If that includes a career as a paralegal she should go back to school. She will then earn the respect of her peers and others will benefit from her experience and education. This is not about anyone else but Casey Anthony. The comments from her attorney are appalling! "I truly believe that she has a lot of skills," "She's better than many paralegals I know. She could be a paralegal or something like that right away. She is very organized, a very intelligent, very computer savvy person, so I think her skills and her desire may lie somewhere in that field." By its very definition, no one without the proper education and/or training becomes a paralegal "right away". I agree with you Vicki. When I first heard this, I honestly thought it was a misstatement or something like that. Then when I looked a bit more into it, I was upset by carelessness of the title "paralegal" that was being used. We work very hard to complete our education and receive that designation. If Casey wants to become a paralegal, then in my opinion she has to go through all the steps to achieve this title - not just have an interest. My question is this: Does Mr. Greene feel she has the requisite skills to hire her as a paralegal in his firm?